Since our launch in 2014, we have striven to push the boundaries of how prompting is used to today and the natural path it will take, designing innovative solutions to keep up with or - even better - to anticipate the changing aspects of productions and broadcast infrastructure. 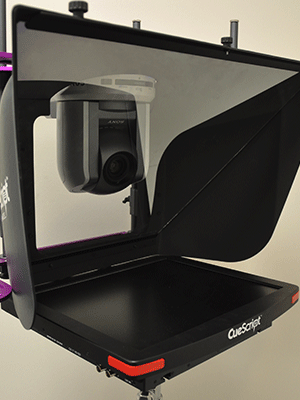 For instance, with the growth in popularity of PTZ cameras, we designed a patent-pending mount for a prompter that would not impede the camera operation. And when a leading broadcaster needed to mount cameras on a track suspended from the ceiling, we sourced optically pure acrylic as a safer and lighter weight alternative to glass. The move to IP is, therefore, something we have been working on for some time; in fact CueScript has been delivering the worlds first fully IP-ready prompting solution since 2015. However, while the IP future is a given, we recognise that not all broadcasters are able to transition their entire workflows instantly or completely. Our systems therefore feature the ability for customers to adopt an IP infrastructure today if they are ready, but it also works with the HD-SDI and Composite video inputs that many studios are still currently using. Then, as their workflows develop around other technologies they introduce, they can add the IP prompting element. The main hub of the CueScript IP-ready prompting solution system is the CueB, which is the engine that offers connection via Ethernet or USB, and the connectivity of near limitless scroll controllers that can also be connected over IP. This gives total flexibility to a broadcaster in how they introduce and use prompting in their workflow. The CueB provides 2x HD-SDI and 2x Analogue signals as standard. Multiple CueBs can run independently or simultaneously, and can be rack mounted in the C.A.R or anywhere in a studio complex. We also offer three devices to control the prompter: the CSSC Desk Control, the CSFSC Foot Control and the CSSCW Wireless Hand Control. All these controllers can be connected either by USB locally to the computer or by Ethernet within the network infrastructure. CANbus is also offered as standard; this uses standard coaxial cable and offers complete plug and play connectivity and flexibility in the studio operation. IP connectivity continues throughout our range of prompter displays, with our CSM LED range of monitors featuring IP as well as HD-SDI and Composite video inputs. Configuration and management of the devices is controlled within the CueiT application. User and access rights can be set in each instance of the CueiT application. A simple drop-down window will show the IP-enabled prompter displays available in the facility or on a location, and there is no limit to the number of displays or distance within network infrastructure. The CueScript IP Teleprompting system uses metadata to send prompt text to the monitor used for viewing. As such this low data-rate stream is not a real-time audio/video stream but a render description language. This provides significant advantages as it does not load the IP infrastructure or require network configuration over and above conventional business IT connectivity. Importantly, we dont use any off-the-shelf consumer products; nothing is re-purposed for use. We listen to our customers feedback and requirements, and design everything in-house for its specific purpose, meaning that all the elements work seamlessly together and do the job they were designed for. This is particularly important for larger broadcasters that cant afford for any links in the chain to fail or stop talking to one another. Our mission and goal has always been to provide a prompter setup that works straight of the box, and that makes the on-screen talent feel comfortable and confident. IP is here, but whether you are ready for it now or in a year or two, our systems will give you reliable and future-proofed prompting today.